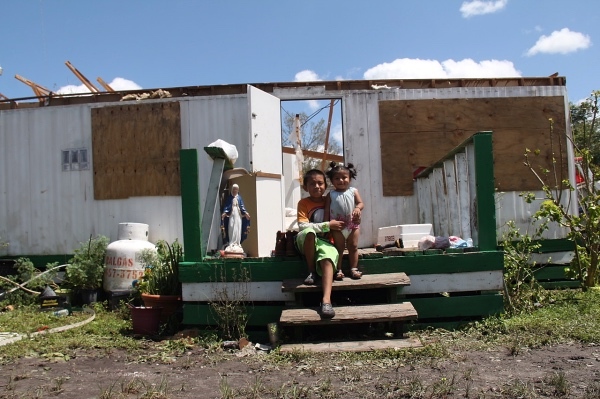 ...Immokalee, the already impoverished farmworker community — and several others north of Immokalee, including Florida’s citrus capital, LaBelle — saw some of the worst of the storm, as the northeast quadrant of the massive hurricane’s eye wall slammed directly into small inland towns along the length of the state. Even as the region begins recovery from Irma, it is imperative that we remember why Immokalee and communities like it are particularly vulnerable to natural disasters like these. Often fleeing war and devastation in their home countries, thousands arrive to Immokalee only to be met by poverty wages (more than half of Immokalee residents live below the poverty line), abusive conditions, and a system that is historically stacked against them. Without a strong social safety net or the resources to rebuild after a major storm, Immokalee farmworkers are among the millions on the front lines of climate change. In the years to come, warmer waters will generate more extreme weather — and further escalate the threats faced by vulnerable communities. Today, we must respond to the immediate needs of Immokalee. At the end of this post, you’ll find instructions for where to direct donations and resources. But we must go further than the demands of the moment. We must continue to follow farmworkers’ leadership to transform the reality that demands they fight for their survival and human rights on a daily basis — we must expand the Fair Food Program. Beyond that, we must stand with frontline communities around the world to ensure they also reduce their structural vulnerability, and to curb climate change while we still can. Given this long-term vision, the CIW has called on the AFF network to continue organizing with more vigor as ever before. Next week, we will announce a major new initiative in the Campaign for Fair Food to intensify the call to Wendy’s to join the Fair Food Program. Stay tuned for the details! In the meantime, Immokalee is calling on our support to get back on her feet. If you are in Florida and are able to support with supplies or volunteering, contact Julia Perkins at julia@ciw-online.org. If you wish to donate to relief efforts to Immokalee farmworkers and other farmworker communities, you can do so securely here. BREAKING: CIW to join Glennon Doyle, Abby Wambach on national Together Live Tour!